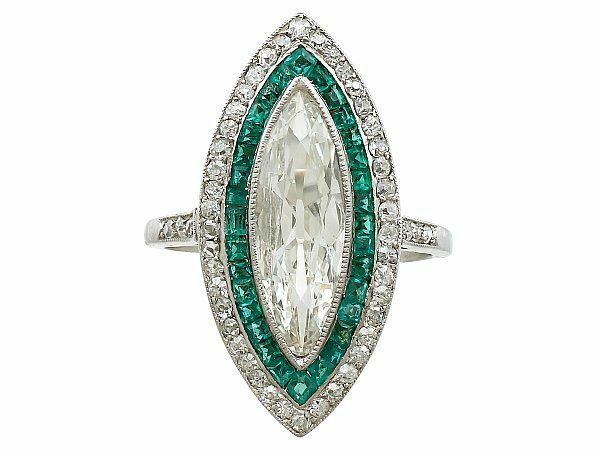 This magnificent, fine and impressive large marquise diamond ring with emeralds has been crafted in 18 ct white gold. The attractive, low profile pierced, scroll decorated, marquise mount is ornamented with a stunning feature 1.72 ct marquise cut diamond millegrain decorated, collet set to the centre of the design. The central diamond is bordered by thirty-two square step cut emeralds, which are framed by fourty-three pavé set Old European cut diamonds. The pierced decorated, elevated ring shoulders are accented with six pavé set Old European cut diamonds displayed within a millegrain decorated setting. The ring shoulders of this diamond and emerald ring blend seamlessly with the plain ring shank, hallmarked to the outer surface with the French 18 ct gold guarantee hallmark (eagle's head). This stunning 1910 cocktail ring is supplied with an independent diamond grading certificate for the marquise cut diamond in addition to an independent diamond grading report card for the supporting stones. This magnificent original antique ring is exceptional quality set with emeralds and very high colour graded diamonds. This large marquise diamond ring is an exceptional gauge of gold and is in excellent condition with a very clear hallmark to the shank.